It's fall again, time for children to head back to school, and for adults to start preparing for winter. 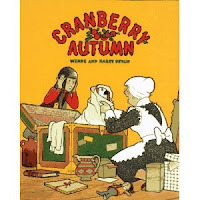 But, in Wendy and Harry Devlin's hardworking Cranberryport, fall finds the funds low, not just for Maggie and her grandmother, but for many of their neighbors, as well. Grandmother solves the problem, by organizing a community antique sale. And, when the plan of their greedy neighbor, Mr. Grape, to pull one over on Mr. Whiskers, and bilk Grandmother out of a pair of Staffordshire china dogs backfires, Grandmother and Maggie come into a small fortune. We checked, and the same type of dogs are currently going for an opening bid of $700.00 on ebay - enough to buy Maggie her needed school clothes, and leave some leftover for a new coat for her grandmother. In typical Cranberryport fashion, Maggie suggests sharing some of their windfall with the entire community, while Grandmother shares another delicious recipe with us. Devlin titles the recipe at the back of the book (which you can also find here, at Light Recipes) "Cranberry Squares", but I think Cranberry Crisp is a more accurate moniker. It tastes like a tart, apple crisp - very yummy, warm, and fall-like, but without the cinnamon. Next time I will add a dash, or two of the spice, to make it just about perfect for a rainy autumn afternoon. We dealt with the omission this time by adding cinnamon to our whipped cream, or rather, whipped evaporated milk, since we didn't have any whipped cream on hand, and using evaporated milk seemed in keeping with the frugal message of the story. I'm not sure Cranberry Autumn is my favorite of the Devlins' series, but the crisp is quite delicious. Your desserts always look so yummy. I have a plan to read Cranberry Thanksgiving this year. I agree with Natalie, I would love to just be there for your deserts! I love this series of books. The crisp looks great. Jeff would love this. I really need to see if any of the books from this series are in my library.